Today I have something a little different to share… skincare products! I have a good little mix here, with items for both the face and body. I have recently become devoted to swapping out as many products possible that touch my body (within reason) to more natural options. There are a handful of yucky ingredients I have done my research on & chosen to stay away from for health and wellness reasons, both now & down the road (post on this later?). Skincare products are something I put on my body every single day, twice a day—so I think it’s important that I stick to all natural ingredients that don't risk potential harm or irritation to my sensitive skin. 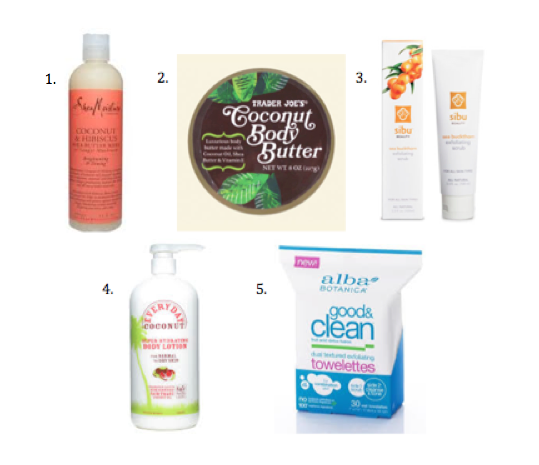 Here are a few of my favorites, especially for the warmer summer months…. Shea Moisture Coconut & Hibiscus Body Wash— This creates tons of soapy suds without the harmful sulfates found in most body wash. It’s free of all the bad stuff, but still manages to make you feel super-duper clean. I also love the sweet, tropical scent. Find it at Target. Trader Joe’s Coconut Body Butter—Super creamy & luxurious, and smells amazing. I use this when I want extra hydration without the greasy feel. Only $4.99 for a tub at Trader Joe’s! Sibu Beauty Exfoliating Scrub—I adore this entire skincare line, but for summertime the scrub is one of my must-haves. Leaves my skin feeling squeaky clean without the harsh skin-stripping ingredients found in some drugstore scrubs. You can find their line on their website, at Vitacost.com, & at some Whole Foods locations. Everyday Coconut Super Hydrating Body Lotion—This is my favorite lightweight body lotion for everyday. It has a light sweet scent that even my boyfriend will use. Soaks in super fast, free of nasty ingredients, & a good value for the amount you get. Check Vitacost.com or your local Sprouts or Whole Foods. Alba Botanica Good & Clean Towelettes—Best facial cleansing cloths I have ever used, hands down. They are alcohol, paraben, & junk-free, and they smell amazing (like orange juice!). They are larger than others I’ve tried which make them super effective at removing my makeup before I wash my face. They leave skin feeling hydrated & refreshed, and I love them! You can find these at Target or Vitacost.com. I buy a lot of my natural products from Vitacost, including my skincare, supplements, household products, & even snacks. They have great deals & are often much less expensive than your local health food store. Here's my referral link that will take you straight to their website: www.Vitacost.com/justjessieb. This link will give $10 off of your first order. Well, that’s all for now! Let me know if you would like more specifics as far as what ingredients I stay away from & why, or if you have any questions for me. Hope this was helpful! i love tj's coconut lotion, too!! it smells like frosting!! Aw, thanks Brenda! So good to hear from you! I have lots more ideas, glad you're enjoying so far :) Love you!